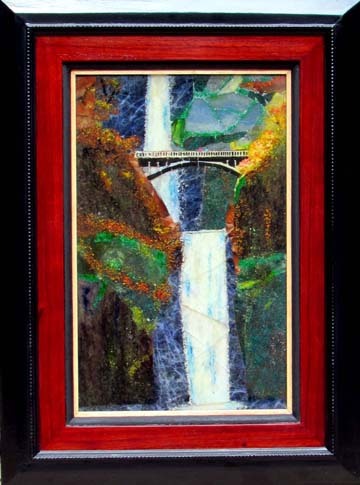 Multnomah Falls is dressed out in her bright fall colors. As one of Oregon's most visited locations, it is located just outside of Portland in the Columbia River Gorge. The white water is made with quartz, the dark blue is made with sodalite, and the fall leaves are ground colored rock. The handcrafted frame is made from hardwood.